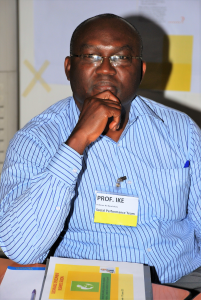 Ike Nwachukwu is a Professor of Agricultural Extension and Rural Sociology at the Michael Okpara University of Agriculture, Umudike, Abia State. He obtained his Master’s degree in Agricultural Communication and Doctorate degrees in Agricultural Extension, both from the Obafemi Awolowo University, Ile Ife. Ike Nwachukwu started his career at the National Cereals Research Institute, where he rose to the rank of Assistant Chief Research Officer. In 2001 he moved to the University of Agriculture, Umudike. Prof. Nwachukwu’s major areas of specialization are agricultural communication, development studies and gender issues. In these areas, he has published extensively both locally and internationally. He has written and co-written ten books in agricultural extension and rural development. He has produced 25 Ph.D students and many Master’s degree graduates. He is the President of the Society for Community and Communication Development Research . He is also the Editor in Chief of the Journal for Community and Communication Research . Ike is married to Prof. Olayinka Nwachukwu and they have three daughters.